Imagine coming home to Gateway Park Apartments. Whether you choose a one, two, or three bedroom apartment for rent in NE Denver, Colorado, near Community College of Aurora, your modern living space will welcome you home. With impeccable built-in features and sophisticated upgrades, luxury comes standard in our garden community. When you’re not preparing dinner in your gourmet kitchen or relaxing with your feet up in front of the fireplace in select homes, take advantage of the great outdoors right in our community. At Gateway Park Apartments, we want to help you unwind. Kick back in a lounge chair on the resort-inspired sundeck surrounding our two sparkling outdoor swimming pools. In the winter, you can use the relaxing outdoor spa for incredible stress relief. 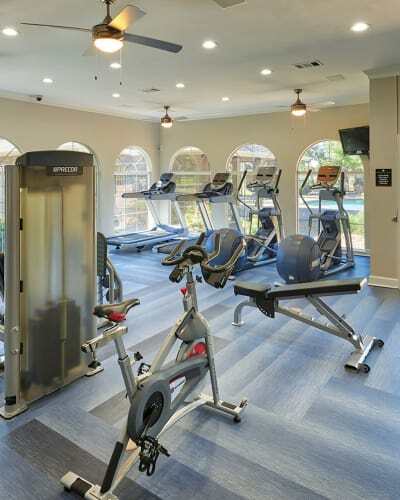 Work up a sweat in our state-of-the-art fitness center complete with modern equipment, cardio machines, and free weights. On the weekends, take your tackle box down to the tranquil on-site fishing lake to see what you can catch, or walk over to the Rocky Mountain Arsenal National Wildlife Refuge for an up-close look at bison, deer, and hawks. For outdoor recreation in your backyard, choose Gateway Park Apartments. Let us show you around our NE Denver, CO, apartments for rent, near Green Valley Ranch.